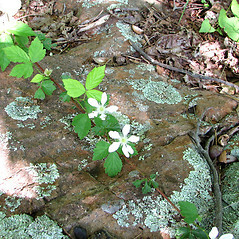 Northern blackberry is a creeping liana with stems up to 5 m (15 feet) long. 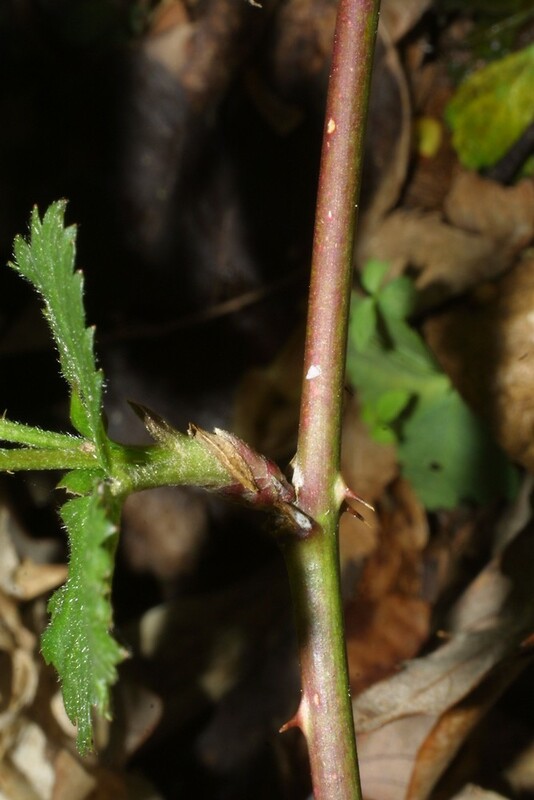 It is distinguished from other trailing species of Rubus by its few-flowered inflorescences with ascending pedicels, glabrous to sparsely pubescent leaves, and relatively stout stems. The fruit are eaten by chipmunks, white-footed mice, and raccoons, while cottontail rabbits and white-tailed deer browse the stems. 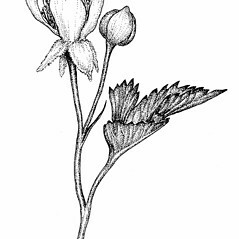 inflorescence with usually 2-8 flowers, each flower on an ascending to spreading stalk, the uppermost stalk usually 3-11 mm stalk (vs. R. flagellaris, with an inflorescence with usually 1-4 flowers, each flower on an ascending to erect stalk, the uppermost stalk usually 10-50 mm long). 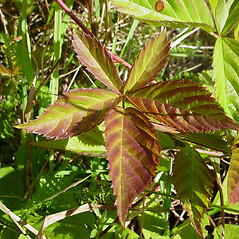 leaf blades +/- evidently pubescent abaxially, with hairs present across the surface, usually noticeable to the touch (vs. R. flagellaris, with leaf blades +/- glabrous abaxially, the hairs, when present, essentially confined to the leaflet midribs and primary lateral veins, usually not noticeable to the touch). 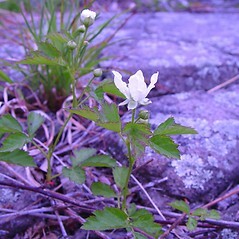 northern blackberry. 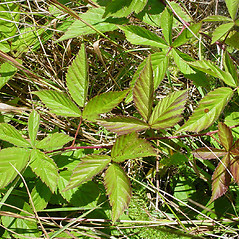 Rubus felix Bailey; R. geophilus Blanch. 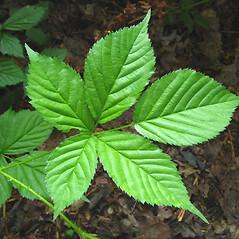 ; R. maniseesensis Bailey • CT, MA, ME, NH, RI, VT. Fields, roadsides, sand plains, forest borders, woodlands, balds, open rights-of-way. 1×12. 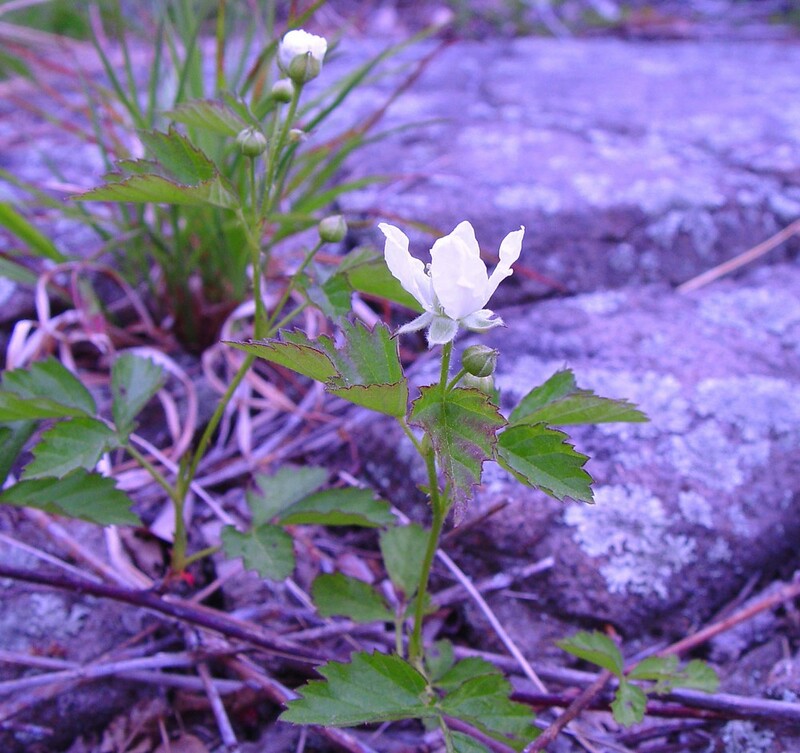 Rubus allegheniensis × Rubus flagellaris → This uncommon blackberry hybrid is known from Ma, Me, NH. 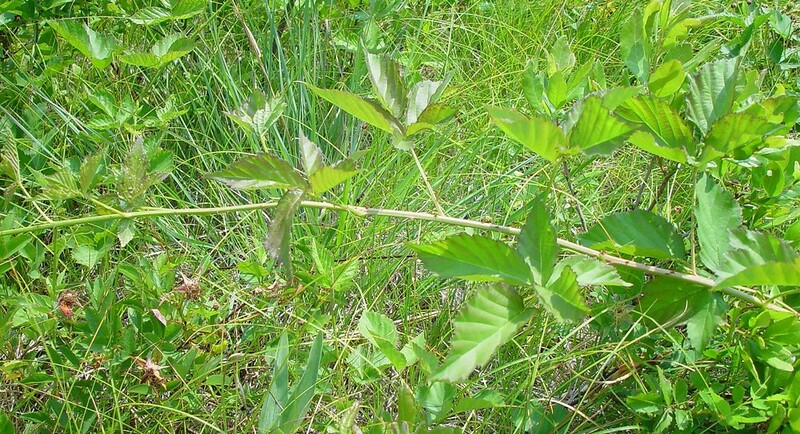 It is marked by primocanes with low-doming to nearly trailing habit that show occasional stipitate-glands, primocane leaflets mostly 7–11 cm long that are sparsely pubescent abaxially, armature of straight to hooked prickles, and inflorescences to 11 cm long that bear frequent glands on the rachis and pedicels. 12×13. Rubus flagellaris × Rubus frondosus → This uncommon blackberry hybrid is known from CT, MA, NH. 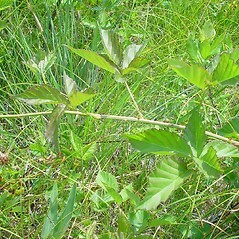 It is marked by primocanes with arching to doming or trailing habit, primocane leaflets pubescent abaxially, armature of hooked prickles, and 2- to 6-flowered inflorescences with a pubescent rachis (but lacking stipitate-glands). 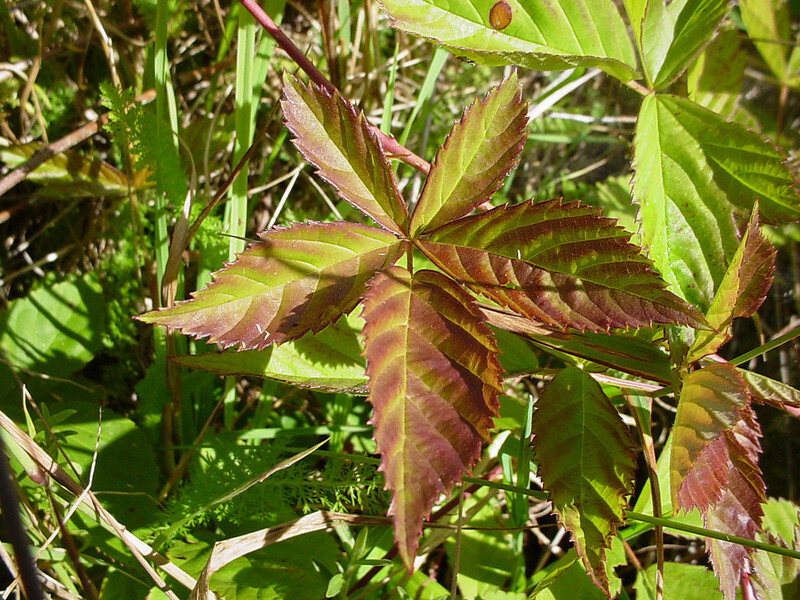 12×14. 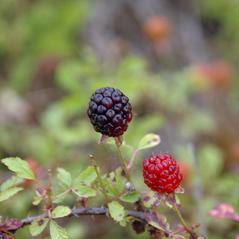 Rubus flagellaris × Rubus hispidus → This rare blackberry hybrid is known from ME. 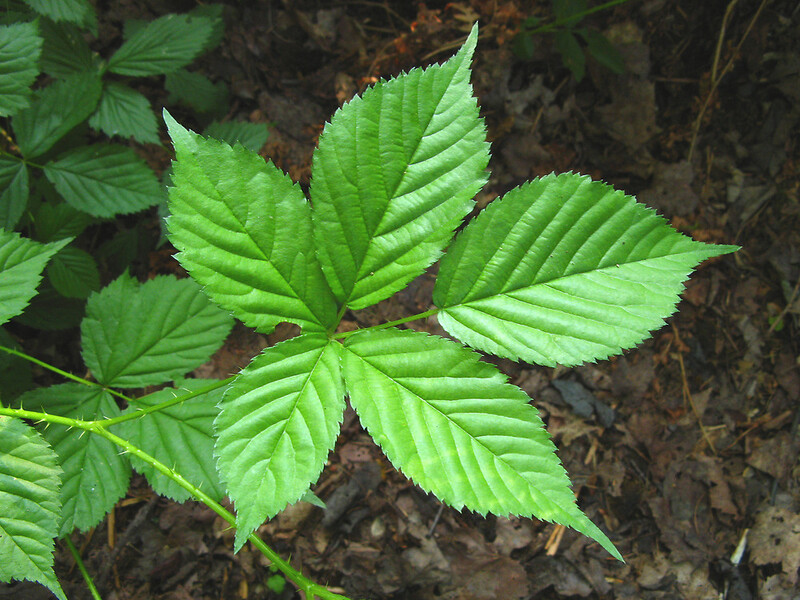 It has primocane leaves with thick leaflets, the leaflets usually numbering 3 but often the lateral leaflets with a lobe on the outer, basal margin (these lobes variably developed, sometimes the leaf with 5 total leaflets). 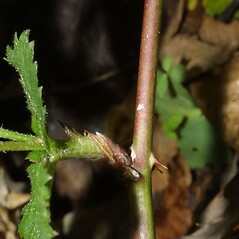 The primocane stems are armed with both prickles and bristles. 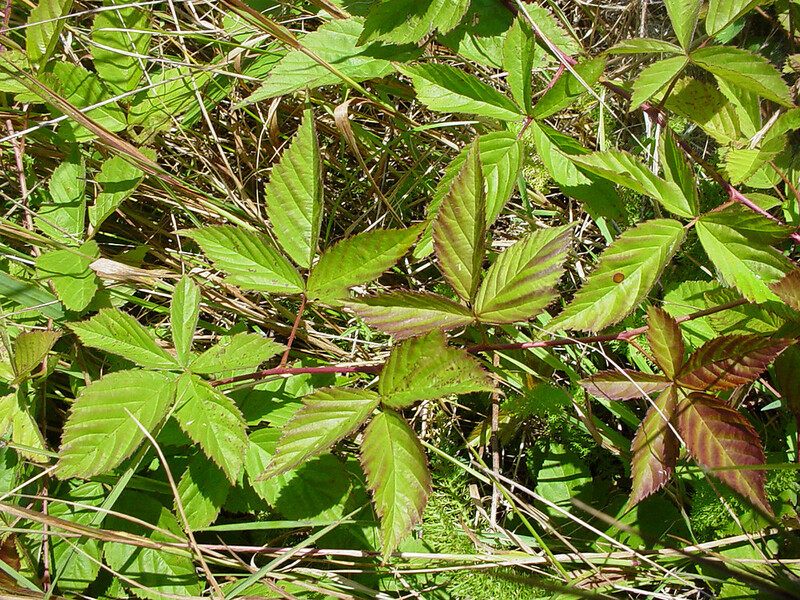 Tentative synonym: Rubus mainensis Bailey. 12×25. 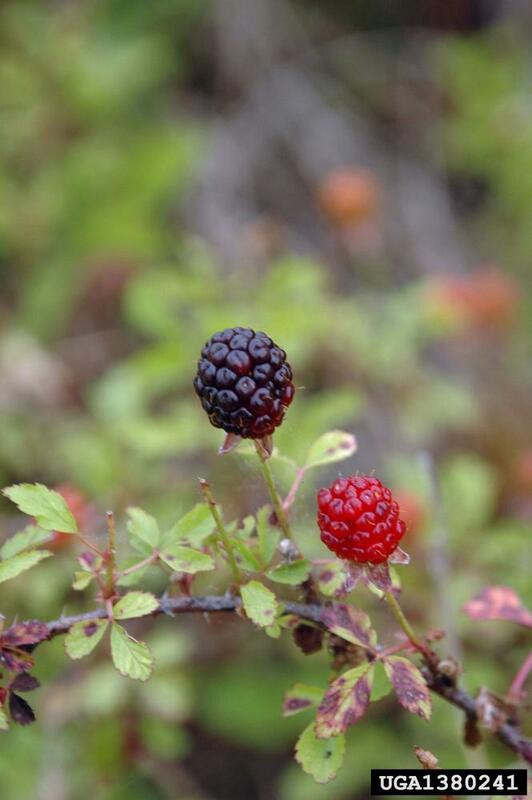 Rubus flagellaris × Rubus recurvicaulis → This rare blackberry hybrid is known from MA. 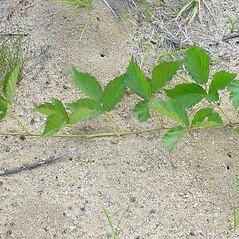 It has the habit of Rubus flagellaris and R. recurvicaulis (e.g., trailing stems). 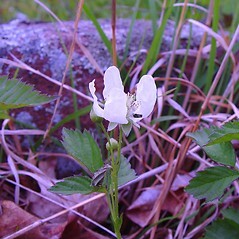 The inflorescence has 3–7 flowers on ascending to erect pedicels (i.e., the aspect is of R. flagellaris but with too many flowers). 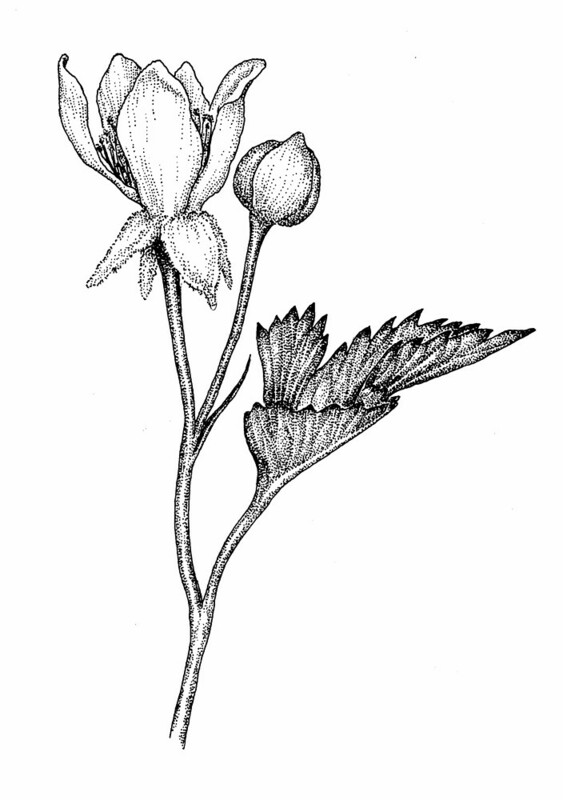 The lower pedicels commonly exceed 40 mm in length.